Envirosax are my reusable bags of choice. They are sturdy, light and roll up small enough that I can keep a couple in my handbag all the time. And they are super cute. 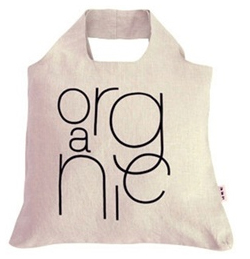 Envirosax recently launched three lines of organic bags. These are the bamboo bags which are 45% bamboo and 55% linen. I love the neutral color and the designs of these. "Bamboo is 100% biodegradable as it is naturally grown, without assistance from man, thriving naturally without using any pesticides or fertilizers. 100% sustainable, bamboo is one of the fastest growing plants in the world." 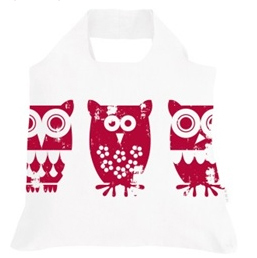 They have a selection of linen bags, of which this owl one caught my eye. Sooo cute! There is also a line of hemp bags available. I liked the ones with the funky lettering "organic" on them. Wanted to let you know that one of your spots you liked and blogged about in Berkeley "Elephant Pharm" unexpectedly closed today. I love Envirosax. Last year I gave everyone an envirosax for Christmas. I specially love the kids ones. They are so pretty also. I love Envirosax, I keep two in my purse and use them wherever I go - grocery store, Target, farmer's market - wherever. I loved the owl one you pictured, I'll have to keep an eye out for that one.